If you know me via Social Media, you might have seen a few of the terse updates I was posting this week. ‘Almost time…’, ‘Tech Rehearsal…’ ‘Full Dress…’ ‘Showtime…’ ‘Exhausted…’ that kind of thing. An extraordinary week has drawn to a close. 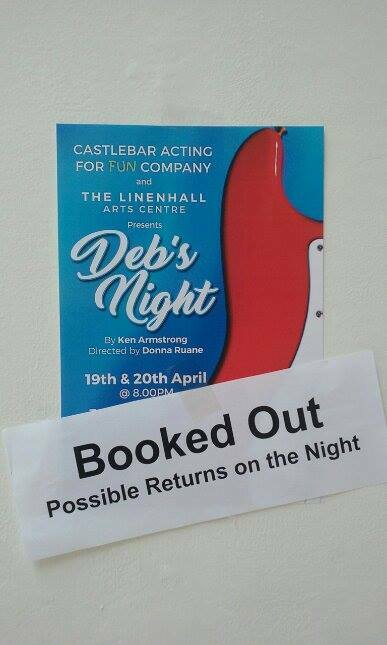 My newest play, ‘Deb’s Night’ has had its two nights in The Linenhall Arts Centre here in Castlebar. It played to capacity audiences and the extraordinary cast received spontaneous standing ovations on both nights. I think I can say this because I only wrote it, they fully deserved each one. So today, after reflecting on things for a day or two, I want to first thank the main players in my wonderful week and then I want to scribble a little bit about the writing of Deb’s Night, partly as an aide-memoire to myself as I get ready to move on to the next one, which is mostly already-written in my head. Thank you to Donna Ruane, who is my friend and who also happens to be a highly talented director and actor. For many years, Donna has run her Acting for Fun classes on Saturdays here in Castlebar. It is one of her many commitments but one that is particularly close to her heart. That title ‘Acting for Fun’ is both slightly misleading and entirely correct. It’s correct because the teens who go there pretty much have the best fun you could imagine. They tend to become tight friends and (from what I know) they look forward to each session with eagerness and anticipation. It’s slightly misleading because the name almost has a casual feel to it, a sort of ‘let’s not take this stuff too seriously’ vibe and that could not be further from the truth. Donna shows her people how to act, really act, and, to her, it is an earnest and important endeavour. This seriousness rubs off on the teen actors. This mix of serious and great fun produces a special kind of acting student. One who loves to act and have fun but who never-ever take it casually. Thank you Donna, for seeing something worthwhile in the Deb’s Night script and for taking it on and for shaking quite a brilliant production out of it. Then there’s those guys I was just talking about in the last paragraph-but-one. The Cast. Eighteen, yes count them, eighteen amazing guys and gals, every one of whom brought their ‘A-Game’ to this endeavour. The feedback I got suggested that the audiences could not quite believe the quality of what they were seeing. I could believe it though, I’d seen how hard they worked and how much fun they had doing it. (there’s that mix again). Then there’s The Linenhall Arts Centre. I’ve written about them quite recently so I better not go on too much but, damn, they really know how to look after a creative endeavour and that’s for sure. A vibrant young cast finds itself enveloped in a professional theatre with a professional director and professional lighting and sound design and professional show management and everybody raises their game to come along with what The Linenhall gives. If you’re here in Castlebar and you’re artistically inclined I would suggest you make friends with the place. See the exhibitions, catch the shows, drink some coffee there. Your creativity will blossom just from spending quality time within those hallowed walls. A particular word for my friend Oisin Heraty who brought the theatre design up to the highest level. Because I mostly write stuff that doesn't use formal sets, in this case, just a couple of stools (well, eighteen) I tend to want to lean heavily on lighting and sound and music to set scenes and tone. Oisin has never let me down in this regard. Also the pleasure of being allowed to work the sound cues myself while Oisin ran everything else (and most of the sound cues too), the ability to watch the play and the audience as-one while also feeling as if I was a part of the theatrical machine that was running it. It all made me feel a bit important and I’m still cruising on that vibe. So thanks mate. For me, it’s kind of the dream come true. To write something as carefully and well as I possibly can, to have twenty plus people working flat out to make it come alive, and for the audiences to come out and enjoy the result. Yes, it’s ‘dream-come-true’ territory all right and I count my blessings that I get to experience all of this. And so now the Debs is over. There may be another outing but The Linenhall premiere is now writ in history. A moment, then, if I may, for me to selfishly set down some thoughts and reminiscences on the actual writing of the play. What drove it and what might have added a pinch of inspiration to it because, as with all my little plays, there were many pinches borrowed from hither and yon. I had written two other full length plays-for-teens and both had been pretty well received. When the second one ‘Midnight in the Theatre of Blood’ was revived last year at The Linenhall, along with the shorter (and beloved) ‘Fine’ I saw the power and potential of the current young cast that Donna had trained up and I resolved to try to give them a brand new play for this year. Teen casts move along quickly to College and Adult Life and they have to be grabbed while they are still around. This was very much a year to do that. I knew I wanted to write about Family and, particularly, about Parents and their Children. I was intrigued to give the teens a platform where they could play out some of their parents concerns and, in doing so, to show them what they sometimes look like from the adult point of view. I also knew I wanted to capture something that I had seen in Donna’s classes. There, in the safety of the group, scenes and sketches would be devised and performed while the other actors sit around and become the audience. I loved how, from this relaxed and fun atmosphere, something dramatic and moving would often suddenly emerge. For that reason, I wanted everybody on stage the whole time, watching their fellow actors as they came centre stage and did their pieces. It’s not a new idea. I read ‘Equus’ as a much younger person and had loved how Shaffer had done it there. I had also seen ‘The Caucasian Chalk Circle (Bruiser’s excellent production) in The Linenhall and had loved that Brechtian notion of the ‘Play within a Play’. The wonderful Mickel Murfi had also directed ‘The Far Off Hills’ in The Linenhall a few years ago and I loved the way his actors stayed around and visibly enjoyed it while their peers were doing their thing. I wanted a number of little families in the play, each with their own story to tell. I ended up with four. A family without a father, a family without a mother, a family with neither father nor mother and a family with both father and mother around. Several people commented that there were a lot of ‘dead parents’ in this play and they were not wrong. The stories worked themselves out and evolved from one thing to another. The notion of the characters Debs Night being a part of the play actually came quite late on. At first, this was a play called ‘My Project, My Family’ in which a school project to look into family histories threw up a series of dramatised stories, the teacher ultimately becoming the central character in the main story. But that didn’t quite play ‘entertaining’ enough. The threat and promise of an impending Debs Night seemed a better reason to have some fun and I think it turned out that way. The stories all may have evolved but there was one little kernel of a story there for the longest time. The story of a dad, a recent widower, and his daughter, alone together in the world and one stupid, silly thing he might do to try to keep her safe. This was always the nut at the centre of the play, everything else grew up around that. With eighteen actors and eighteen characters in the play, there was another challenge I was keen to address as best I could. I needed each character to have their own little story arc. Without going overboard on the technicalities I simply resolved that each one would have their own object of desire and something standing in their way of getting it. Some were small, Tam wanted to be a tree but the Stage Manager wouldn’t let her. A tiny thing but the audience went with it and many commented on Tam afterward. The most rewarding comment, repeated quite a bit, was how every actor had their part. Audiences don’t generally concern themselves consciously with such things as story arcs and desires and impediments to achieving those desires but they do respond to the tiny stories that emerge when these things are thought about. In case you think I’m vanishing up my own arse here, talking about Brecht and Shaffer and such, the play also purloined little nuggets of stuff from many much more street-level sources. ‘Napoleon Dynamite’ definitely played a part. If you watch the climactic scene and if you’ve seen my play, I think you’ll know what I mean. ‘Mary Poppins’ featured more heavily in earlier drafts but a tiny little taste still remained in the final product. ‘Dangerous Liaisons’ is clearly in there somewhere, as is ‘Hamilton’, Reeves and Mortimer’s ‘Shooting Stars’ and, of course, Bruce Lee and ‘Enter The Dragon’. An online pal, Darragh Doyle’ once said something on Twitter, years ago, and that has clearly turned up in the play. None of this stuff is stolen, not to my mind anyway. I think it’s a powerful writing tool to try to be open to those myriad little things that give you pause on any given day. These, to my mind, can sometimes become tiny keys to our souls. This was the play where I finally learned the value of scene index cards in the writing process. I wrote about that here. I could never make them work for me until David Keating, in a great one day seminar, explained how he used them right at the end of the process instead of at the beginning. This really focused the mind on what was missing in the play, narratively, and also tightened the flow and pacing of the thing. Remember that for next time, Ken. Wait. Just one final thought. The play has a slightly peculiar structure. It starts out in an element of deliberate chaos as the group try to work out how to do their little devised play. There are mess ups and miscommunications and pratfalls and arguments. In the end too, there is a sort of joyous chaos, a relief that the silly thing is nearly all over. But in the middle… in the middle some stories emerge, the tomfoolery slips away and some moments of drama and pathos peeps out. This is where Tom Waits has yet again inspired me, as he so often has in the past. He has a song called ‘Please Wake Me Up’ on his album ‘Frank’s Wild Years’. This little play of mine owes quite a bit to that song. Not on account of the words and not on account of the music but on account of the intangible chaos that exists at the start of the song and the chaotic refrain at the end. Mostly, it's on account of the lovely melody that emerges briefly right there in the middle, in among all that chaos. Have a listen on YouTube, I think you’ll see what I mean. Here's a link. I’m generally my own toughest critic and I’m rarely entirely pleased with the writing I do but I must confess that I am quite proud of ‘Deb’s Night’. I know I owe much of that to the Actors and the Director and the Designer and the Theatre who made this production go as it did but, hey, I did my bit too. Congratulations Ken to you and the team. I have no doubt that it all went really well. I enjoy your writing and I only get snippets, if you like, of it. You clearly value the cast and wider team and I'm sure they all felt supported by you. Well done. And indeed, please keep writing. I’m like you, I find it hard to sit back and say out loud (especially aloud), “I couldn’t have done that any better.” But even if I can bring myself to say that a part of my brain’s thinking, That may be true but someone could’ve done it better. The real question is: Is it as good as it needs to be? It doesn’t need to be perfect but it does need to be up to the job for which it was intended. In other words: Does it work? And the damndest thing is we have to put it in the hands of strangers who don’t love it like we do and watch them get a feel for it, me with my readers and you with your audience. We have to sit there and wait to see if anyone got what we were really up to. That’s where the “stealing” comes in. It’s not stealing; it’s appropriating; it’s shorthand. If either of us were to mention Adam and Eve in a work immediately a whole set of images and ideas would drop into place—they wouldn’t be able to help themselves—and that would flavour the text that follows, like popping in a Polo Mint before drinking a glass of milk. The problem is that those who know Brecht and Shaffer are probably going to be less than familiar with the work of Bruce Lee and Reeves and Mortimer and so no one—no one bar us—is ever, EVER going to get what we do the way we want someone (our ideal reader) to but the more we pile in there the better chance we give everyone of picking up on something that’s not obvious and being able to feel a bit pleased with themselves. I remember when I was researching All That Fall and noticed Beckett had two boys in the play called Tommy and Jerry which immediately made me think of the Hanna and Barbera cartoons. I could find no reference anywhere in my textbooks to back that up. Is that what Beckett was alluding to? He’s not here to ask and even if he was he probably wouldn’t say but I’d like to think I picked up on something everyone else missed. Makes me feel right smug. I’m pleased your play went well but I’m more pleased you’re pleased. That is an achievement.